Here’s a great article from the Wall Street Journal about the complexities of measuring and trading in bushels. We all use the term frequently when describing grain bin capacities, but when using the term to trade large quantities or set commodity prices, the actual calculations become quite involved and the quantity traded can become pretty ‘abstract’ as described in the article below. Soybean prices have long been quoted in bushels at the Chicago Board of Trade. Trade tensions between the U.S. and China this year have caused gyrations in soybean prices, which recently climbed above $9 a bushel. They also have people buried in soybean math. Prices of agricultural commodities have for decades been quoted in bushels at the Chicago Board of Trade, yet many traders and farmers have never actually come across soybeans in the quaint wooden basket that has existed for centuries. “Most people haven’t seen a bushel basket—I never have,” said Anthony Stinton, a soybean meal trader in Greeley, Colo. Scrawled on a yellow sticky-note on his computer is a formula he punches into a calculator multiple times a day to convert metric tons of soybeans grown in Brazil into their American bushel equivalent. “It’s kind of an abstract amount,” Mr. Stinton said. During those meetings, there is “always a 10-second break when we make these big calculations on these calculators going back and forth like we’re in the fourth grade,” said the Swiss-based American trader. Even though Mr. Haendler has the formula memorized, getting the numbers wrong could be potentially costly, he added. To help market participants with their math, CME Group Inc., which operates the Chicago Board of Trade, has a 44-page pocket guide that includes scores of weight-conversion tables for a range of commodities. For example, it recommends that to convert 11,000 metric tons of soybeans to bushels, users can simply add the conversions for 10,000 metric tons (367,437 bushels) and 1,000 metric tons (36,744 bushels) to get the total of 404,181 bushels of soybeans. Each soybean futures contract is made up of 5,000 bushels. On the Scott family farm in Delphi, Ind., there isn’t a bushel to be found. “It’s just an idea in our head,” says Brian Scott, who grows soybeans with his father and grandfather along with corn and wheat. “We think in bushels but they don’t really measure in bushels,” he said. Instead, trucks are filled to the brim with commodities and sent to a depot to be weighed before the produce is sold to trading firms. ”When you deliver, they measure in pounds,” Mr. Scott said, noting they give a receipt with a bushel measurement too. One truckload of beans weighs roughly 1,000 bushels, he says. America remains an outlier holding on to the old imperial, or U.S. customary system, of pounds and acres when the rest of the world has largely shifted to the metric system of kilograms and hectares. Other countries that use the imperial system include Liberia and Myanmar. In addition to bushels, the U.S. also uses pecks and lugs, which are wooden boxes of no standard size. Traders say the challenge with bushels is that they are a measurement of volume, so the weight of whatever is in it varies depending on the commodity. While soybeans and wheat weigh roughly the same, corn is slightly lighter. “If I take the price of Chicago wheat and I want to know what it means for the rest of the world, I multiply it by 36.7437,” said Chris Bird, a senior global wheat trader at Engelhart Commodities Trading Partners, without missing a beat. As he has to do the conversion 20 or 30 times a day, “I have it set up on my screen to do it but honestly I could almost do it in my head,” he added. There’s also confusion between Canadian and U.S. bushels, which have different capacities. The latter is also known as the Winchester bushel—named after a British town—first mentioned in a law in the 17th century and was defined as a barrel that is 18-1/2 inches wide and 8 inches deep. The measurement was abolished by the English in 1835, a year before the U.S. Department of Treasury adopted it as a unit of measure. FarmLead, a Canadian-based online marketplace for soybeans, wheat and other commodities trades, has a calculator on its website for customers to convert pounds, tons or other measures to American bushels. The soybeans currently for sale on its site are stored in a flat bottom bin. Brian Rohrig’s hog farm outside Des Moines, Iowa, sometimes uses physical bushels made of aluminum to measure soybean meal before it is mixed into feed for the pigs. The bushel baskets are a decent volume gauge, said Mr. Rohrig, but there’s one downside: they are much heavier than a five-gallon pail. The machine his farm uses to mix animal feed now has its own weighing scale, so there is less need for the bushels, he added. We are constantly looking for products that are of high quality, extremely tough and that stand up to abuse from all types of animals. One of those that also offers extreme protection from a common problem, rust, is part of the Tarter brand. With it’s unique design and extreme protection, the Galvanized Cradle Round Bale Feeder is going to be doing double-duty for a long time on your farm and ranch! The unique cradle design makes the hay bale feeder very versatile as you can feed both horses and livestock from the same feeder. 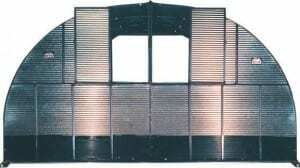 You don’t need separate feeders for your cattle and equine, they can both use this feeder easily. Traditionally, you would want a closed top feeder for livestock and an open feeder for horses, but because the hay is elevated above the ground, you won’t need the barrier to keep your cattle out and your horses still have easy access. To make loading easy, one side has a completely removable end, or entry door for your bale. Simply slide out the end piece that locks into place and the entire side of the feeder is open for easy loading. See the video below for a quick overview. With this unique system, the bale can be driven directly into the side of the feeder and safely set into place. No need to drop the bale in at an angle, or risk the feeder falling over or being bent when the bale falls in. The removable panel makes the loading process simple and easy. It really is the cleanest of the loading procedures out there. Although extremely rugged and designed for use outdoors with livestock, when galvanized, the protection level from the elements is taken a step further. It offers the best defense possible from rust even when left in the harshest of conditions. It’s always best to keep your feeders out of the mud and water, even when galvanized, but with that special finish, it’s as protected as you can get from water and rust so it won’t suffer the quick fate of rusting out that ruin so many traditional steel feeders. To go the extra mile, there is even a clear coat applied as a final finish over the entire feeder! There’s really nothing else you could do to provide more protection from the elements than what Tarter has done with this feeder. As pointed out earlier, the design is extremely easy to load through the removable end gate and the elevated bale is kept off the ground and away from rot-inducing moisture. You won’t need to lay your bale on a pallet or come up with some other ‘trick’ to keep your hay off the ground and fresh. Simply set it in this feeder and you’re done! This is what saves you money! This design is also built on skids to aid in moving it around from pasture to pasture as needed. It is constructed with a sturdy 1-3/4″ round steel tubing and weighs 108 pounds for easy management. All around, this great design allows you to feed both horses and cows and when coupled with the galvanization, it is a long-lasting, sturdy, time and money saving feeder that will work well with all your animals! Contact Barn World today (720) 238-2190 or at Sales@BarnWorld.com and we’ll be happy to forward a quote that includes shipping to your farm or ranch! It’s officially spring and that means calving season and it’s time to make sure you have the livestock supplies and calf warmers needed to protect your newborn calves from ol’ mother nature. Make sure you’re ready to provide the excellent care required after birth when your new livestock enter the great big world. The best protection for newborns is offered by a polyurethane calf warmer with an enclosed heater that will create a comfortable enclosure to protect and give privacy to newborns. Constructed from medium density polyethylene, these durable warmers come complete with a heater to keep your calves cozy, dry and comfortable during the first critical hours after birth. The interior provides enough room to feel secure, stand up and dry off while getting used to their new environment. With a hinged top section that is removable for easy entry and cleaning, this warmer provides the ultimate in accessibility. The slotted floor is raised so heat easily circulates throughout the entire unit before exiting the vent in the top of the lid. The top section vent also serves as an easy way to view the calf without having to open the lid. The floor is very sturdy and is designed to handle the weight with stainless steel supports. The exterior bottom is ribbed so it may be moved or dragged around the pasture with ease and the rounded front bottom end allows it to slide over obstacles on the ground. There is also an optional steel hitch that can be used for towing with the vehicle if needed. The warmer comes complete with a high performance 110 V heater, three heat settings and two settings for the fan for an accurate temperature control in almost any environment. It’s large size of 45 inches tall, 24 inches wide and 50 inches long allow for plenty of room and movement in a secure environment. Make sure your calf has the best available environment provided to it so it may have a quick and healthy recovery from birth. These warmers are essential to giving your animals the best chance of a healthy beginning and prevent it from experiencing the shock of leaving the warmth of the mother to the cold and sometimes frozen ground. Contact BarnWorld.com today and we’ll be happy to help with all your livestock needs – from cattle guards to saddle pads, Barn World has the equipment for your farm and ranch. To provide the best care in the critical after-birth hours of your calf’s life, be sure to enlist the help of a calf warmer. Calf warmers create an excellent shelter and warm nurturing environment for new born calves. 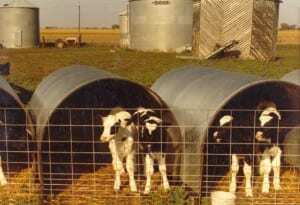 Usually constructed out of a durable, long-lasting and rust proof medium density poly, this animal shelter is a must for newborns and should be in every livestock supply arsenal. 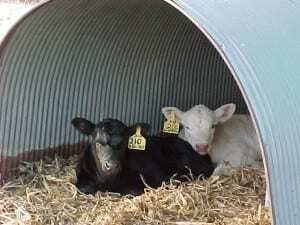 New born calves require a warm enclosed space during the critical hours right after birth. They are vulnerable to the cold and need a safe place to recover from the birthing process. Barn World calf warmers have top of the line heaters located in the rear of the warmer in a separate enclosure that provides a steady warm, circulating flow of air. The area is large enough so the calf can stand up or lie down while remaining in the interior warmth of the heater. Being contained allows the identity scent to remain intact so the mothers will instinctively reclaim their rejuvenated infant once they’re ready to be released. Barn World carries the Sioux Steel calf warmer with the following top-of-the-line features including a fully controllable an automated heater. • The warmer measures 45” high, 25” wide and is 48” long to allow for maximum comfort inside. To keep your young, newborn livestock healthy and to give them a great start at a long and healthy live, a calf warmer is a must during the crucial hours after birth. Providing a safe and comfortable environment for your animal is a must to ensure a great beginning in a stress-free setting. To take advantage of all the calf warmer has to offer, call (720) 238-2190 or visit BarnWorld.com today for all your livestock supply needs and remember, they carry everything from cattle guards to saddle pads! 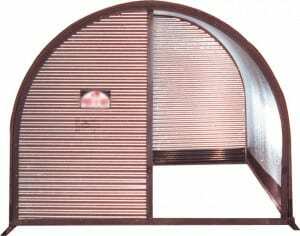 Animal Shelters from Barn World – portable livestock shelters! Animal Shelters now at Barn World! Barn World is proud to offer a line of portable steel shelters that are designed to be livestock shelters but come in sizes large enough for efficient to be equipment and storage facilities as well. 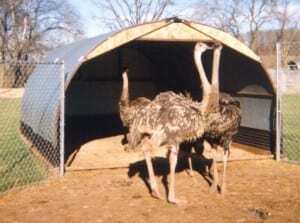 Whether you need an animal shelter for goats, calves, Ostriches or Emu’s, there’s an animal shelter built for you. All of the huts are constructed from steel and are available with swing in or out bucket holders and bottle holders. There are also options for the front and back of the shelters. 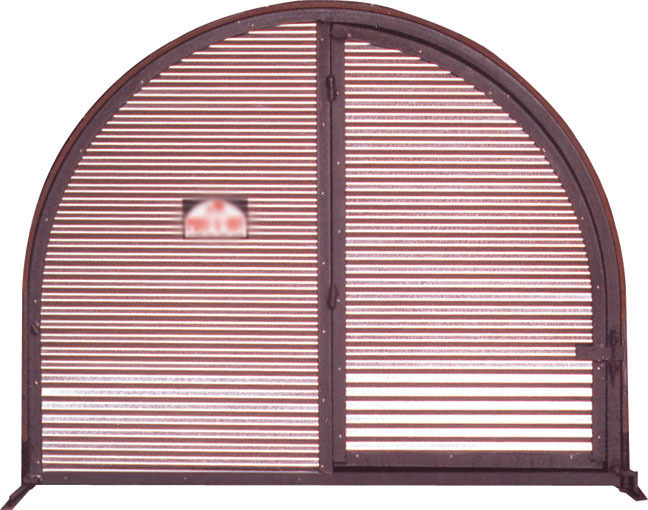 You may choose from the fronts being partially closed with a solid immovable panel that covers half of the entrance, or get a full closure with the optional swinging door if desired. The small huts measure either 4-1/2’ or 7-1/2’ long in width. They come pre-assembled and like all the shelters, have the option of the front enclosure without the door or with. The height is 3’10” and light weight of only 145 lbs, allows for easy mobility and greatly increases the uses for this small building. They come with anchors, one in the back and two for the front make your portable shelters a permanent solution until you’d like to move them for another use. Transporting the huts is made more efficient by design. Up to fifteen of these smaller shelters can be loaded in a pickup when you’re ready to move them for another use. Extremely popular with pig and hog operations, they make great farrowing shelters. Making them tough is the galvanized, heavy-duty corrugated steel reinforcements and heavy angle irons frames. These buildings are designed to shine in the worst of Mother Nature as well as your livestock. These huts are great for large birds and come pre-assembled in 7’ long sections. You may choose from 7’ as the shortest length and add sections all the way up to your longest use need. Available in 8’, 12’ and 14’ widths, they offer a wide variety of uses and allow for growing and large herd sizes. Assembly for these portable and yet permanent buildings takes a quick 2 hours and with the included 4×4 skids, you’re never stuck with a shelter in a specific place. All necessary parts are included for complete assembly. The larger animal shelters come in widths of 8’, 10’, 12’ and 14 feet while the lengths are in any increment of 7’ and although they are not pre-assembled like the smaller shelters, it will only take two men or women, 2-4 hours to completely build them. These larger huts come with skids made of 4×4’s to make it easy to move them in the pasture or around the farm and ranch. The 14’ wide hut is plenty big enough for a full size pick up. You can even open the doors to get out when parked inside. It’s extremely useful store equipment out of the snow, sun and rain and can even make a nice workshop. There are large vents located on the back wall that open up to allow for ventilation and ‘airing out’ in the summer. To offer the portability and versatility inherent in the design of these buildings, it is necessary to anchor them to the ground. Please note that due to varying soil composition around the country and from county to county, anchors are not included with the larger shelters, but are included with the 6’ wide huts. For questions or information on the animal shelters or for assistance any farm and ranch livestock supplies or even cattle guards, please call (720) 238-2190 or visit BarnWorld.com today! Raising an animal is not a walk in the park it needs necessary skills and talents in order for you to produce animals which can generate the best quality meat. If you think that raising cattle is easy you should think again because like humans they need to have love and affection in order for them to become profitable. You need to keep in mind that animals have depression if you do not take good care of them. You do not need to follow a cattle around to make sure that it is happy, the weight of the cattle in cattle scales will show you that you are doing a good job. It will take more than an hour of your time a day to watch your cattle since all they do is eat grass, you need to have necessary equipments so that you can ensure that your livestock is healthy and productive. Equipment like bulk feed bins will ensure that your cattle is eating to become heavier and healthier. Healthy cattle are said to produce the best meat in the market, when your cattle is producing healthy meat then you can say that you are raising good livestock animals. To ensure that your animals are producing the best meat, you have to make sure that your animals are having the right necessities. They need an environment where they cannot be harmed by children and other people. The animals also need clean water from time to time to relinquish their thirst and lastly they have to eat well, feeding them with hay feeders can ensure that their food intake is normal. A thirsty and hungry animal can never produce the right kind of meat to pass the meat requirements. It is very important that the meat itself is healthy because many consumers will be feeding on it. Many factors will contribute so that your cattle can produce good quality meat that can pass the standard in meat production. Ensuring that your animals produce lean meat will ensure that you will gain profit beyond your expectation. Having a good environment and a good barn will ensure that your animals are happy resulting in greater profit and great feedback from your customers. It is like an advertisement because you advertise results, so that you can gain the necessary feedback that you need.